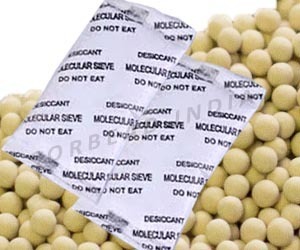 Among various other desiccants, molecular sieves are considered as the most effective option to remove the water or humidity from liquids and gases. Molecular sieve desiccants give more pure and powerful outcome than the silica gel and alumina desiccants. They are generally small and uniform pores that help in making these molecules an ideal adsorbent. When any gas or liquid passes through these sieves, the molecules in smaller size get adsorbed on the surface of this desiccant while the larger molecules get easily passed through. Water molecules get caught in the pores and allow clean liquid or gas to pass through. Molecular sieve packets are used to perform this task effectively. These packets containing molecular sieves are designed to meet the exact specification of variety of applications.